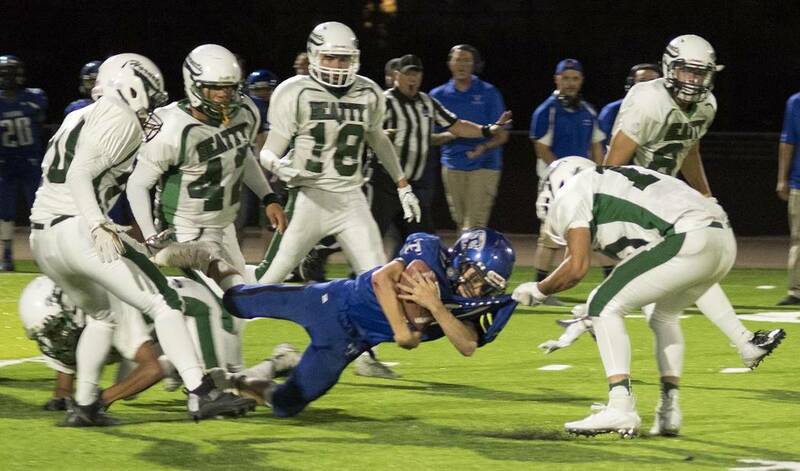 Senior running back Yadir Rodriguez returned a kickoff 85 yards for a touchdown to cap the scoring as the Beatty High School football team opened its season with a convincing 34-6 victory over visiting Trona, California, on Sept. 7. Richard Stephens/Special to the Pahrump Valley Times Max Taylor caught a pass for a 2-point conversion after a Jacob Henry touchdown run that gave Beatty an 8-0 lead over Trona on Friday night in Beatty. The Hornets won 34-6. Richard Stephens/Special to the Pahrump Valley Times Senior Yadir Rodriguez returns a kickoff 85 yards for a Beatty touchdown during the Hornets' 34-6 opening win over Trona on Friday night in Beatty. Richard Stephens/Special to the Pahrump Valley Times A swarm of Hornet defenders stops a Trona runner during Friday night's 34-6 Beatty victory. 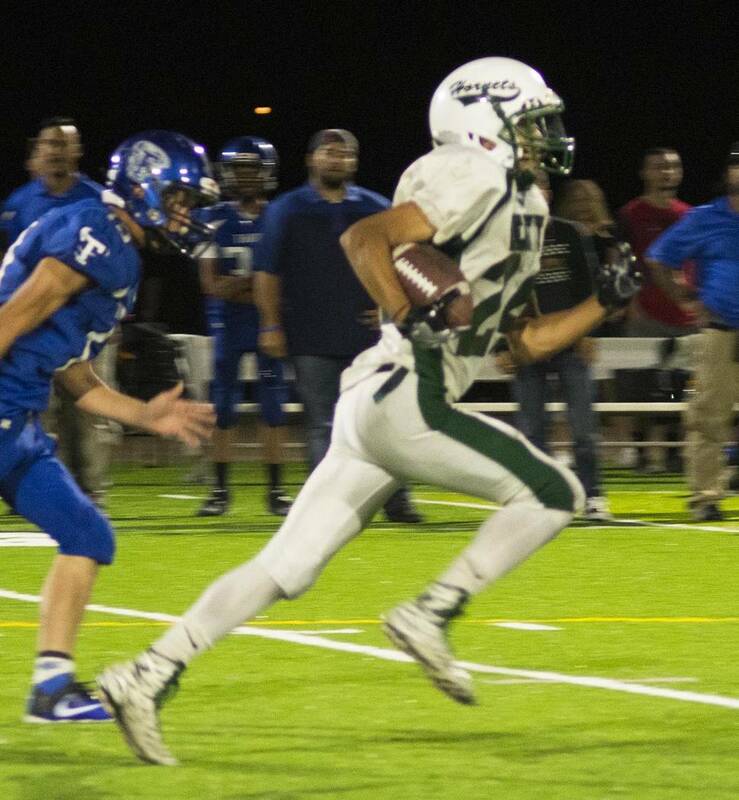 Senior quarterback Jacob Henry scored on runs of 5 and 10 yards, while junior running back Fabian Perez raced 15 and 20 yards for scores for the Hornets. “It was a good solid first game out,” Beatty coach Leo Verzilli said. Not much went wrong from the Hornets’ perspective, according to Verzilli, who said the Hornets also capitalized on a few breaks. 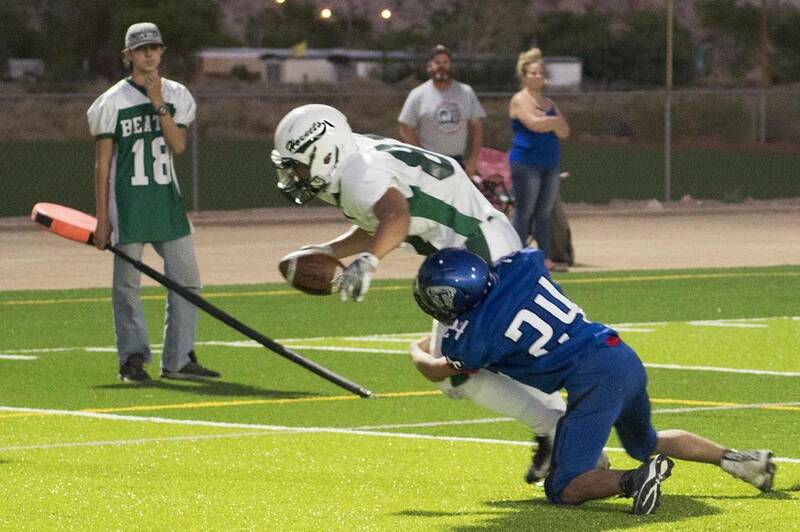 The offense was able to score despite Trona’s ability to take away some of the Hornets’ weapons. The Hornets didn’t pass much, but they were effective when they did. Nothing quite as dramatic as Rodriguez’s kickoff return. Verzilli also was pleased with the Hornets’ defense, which held the Tornadoes scoreless until it no longer mattered. “We got the young kids in at the end, so that was good,” he said. “That’s when they got the six. They hit hard, they tackled hard. It was a good test for us. The Hornets originally were to have played Sandy Valley this week, but the Sidewinders again were unable to field a team. For a while, it was an open date on the schedule, but Verzilli found a game. “We were supposed to have an opening because Sandy Valley dropped out, but we found out some of the smaller schools in Las Vegas are trying to save football, and they’re playing eight-man games,” he said. In one day, Verzilli worked out a game against Mountain View Christian, which was to be played Thursday night in Beatty. Next up on the schedule for the Hornets is a trip to Alamo to face longtime powerhouse Pahranagat Valley in their Class 1A Southern League opener at 7 p.m. Sept. 21.